When we talk about work/life balance we think of the scales of justice where work is one side, and life is on the other. However, the reality of work and life is that it’s a work-life blend. It has become the norm that we take work home, but it is still not the norm to bring home to work. Not that children should be brought to the factory, but managers should know about the big life decisions that employees are making and contemplating so that the employer can support both work and life of their employees. 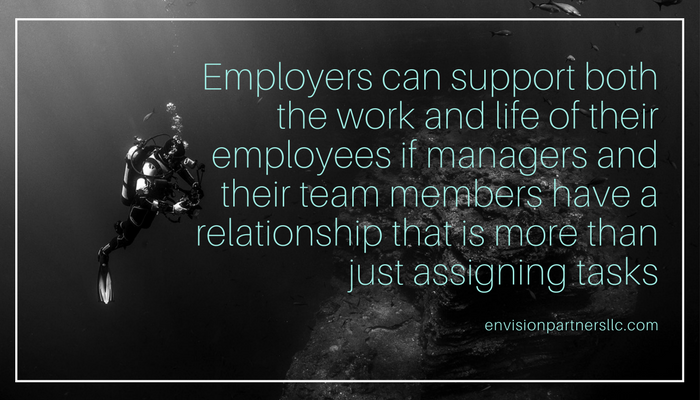 This requires that managers and their team members have a relationship that is more than just assigning tasks and measuring performance. Many managers have gotten comfortable at understanding what drives each person at work in order to the right role and even to give career guidance. However, none of us, including your team members are making decisions in a vacuum. It is important to know what else is going on in their life that might affect their workplace performance—including a sick child, a child going to college, or looking for a lifestyle change. Only if you know what’s going on with your team do you have the capacity to help such as assisting the employee to find a different role in the same company closer to home; making it more appealing to stay longer, or setting up a different working arrangement. Coming back around to the age of the new employees –21-25 years old, they might do well to have a more experienced person in their life to help them make the decision. In this way, the manager has the opportunity to be a mentor for their younger team members as they make these major life-work decisions.